There are some common areas that young people who have experienced trauma struggle with and that may create some difficulties in their life. These include decision-making, managing emotions, helpful thinking and social connections. By helping them improve on these often basic skills they may not have learnt, they may see some real difference in their lives. You know that many young people who have had experienced trauma often have lots of problems to deal with and that can make them feel pretty overwhelmed. 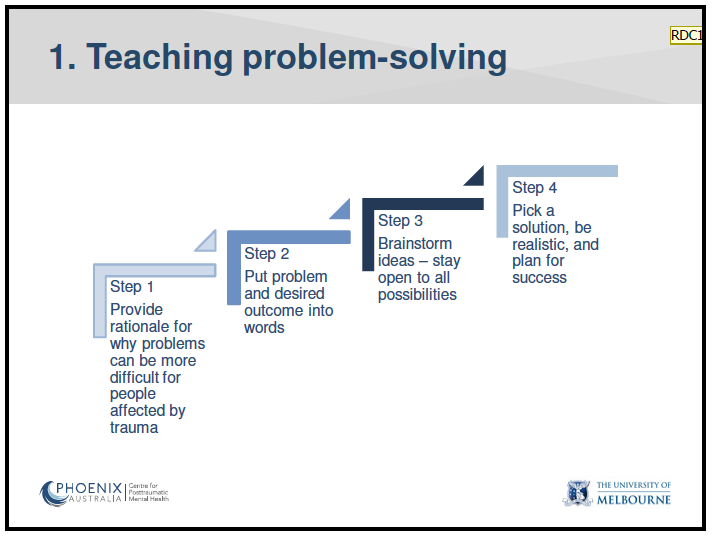 Trauma can really impact on how you may manage the problem and see some solutions. There are things I could help you with that might come in handy when something comes up. Is it familiar that the young person you care for struggles to tackle challenges or solve problems that they come across? The effects of trauma i.e. changes in attention and concentration skills, difficulties with organising, and a lack of time and space to work through things, can all impact on the young person’s ability to make decisions, particularly when they are triggered. A lot of the time this means they choose the first, instinctual option. This is often one that has been unhelpful but heavily reinforced as effective i.e. substance use. 1. Help the young person put the problem and what they want to happen into words. Have a think firstly about whether the young person is in control of this problem. Also is it actually something you can help with. Ask them where they want to start – somewhere simple. Only offer your own suggestions as a last resort. It is better for a young person to think about their own skills and supports that could help. 3. Help the young person pick a solution. Make sure it is realistic. Maybe look at the pros and cons of different solutions. 4. When you have chosen a solution, try making a plan with them about where to go from here. Set some small, realistic, specific steps, - what, with who and when. Maybe even brainstorm things that might get in their way. What has caused problems in the past? Help the young person identify their triggers and how they experience these reactions. Remember that triggers may be really obvious or they may be things that a young person might not even realise such as a smell, noise or subtle sign of rejection for instance. Exploring these after they have happened is a good way to unpack it a bit further. “What is going on when this happened” Consider their thoughts, physical feelings and emotions as well as what was actually happening in their environment. When people are aroused they often look to engage in activities that are congruent with their level of arousal. A lot of the time this means risk-taking behaviours. Always try to remember that the way young people are managing difficult and stressful situations is the best possible way they can. A good way to start to explore these strategies is to ask how they are working for them at the moment. There are many different strategies that can help with managing difficult and distressing emotions. Attending to the physiological impacts i.e lower physiological arousal, is usually best first step. Sometimes you only have a short time to explore some of these skills with a young person. If so, consider calming skills like the following. Breathe out slowly through your nose or mouth and very slowly say (out loud of in your head) a word like ‘calm’ or ‘relax’. Count to four slowly, and then take another breath. Take about 10 breaths or more. For more ideas have a look at Smiling Mind. Both of these not only help shut down the flight/fight response but also means the young person stops focusing on what they are angry/frustrated about and instead on managing the exercise. Encourage them to feel the sensation of being connected to the floor, wall, chair or thing. Remind themselves of where they are and what they are doing. Some other ideas could be using music, blowing bubbles or other sensory distractions such as a strong nice smell such as lavender. All of these indicate to the body and mind that it is unlikely there is a current threat. Be careful, sometimes techniques such as relaxation or calming triggers a young person as this feeling may be associated with their trauma or it may be a feeling of vulnerability that then triggers their arousal. Sometimes, though you may have some more time to explore different strategies and make a bit more of a plan about how they might manage a difficult situation in the future. A great way to have this chat is to get them to think about a simple and common trigger for them such as a place or person. Something that may trigger an increase in heart rate and shallow breathing provides a good opportunity to practice these more helpful strategies. Then use this to reflect on strategies that may be useful to cope with the situation before it happened, during the event and afterwards. This may be simple things such as looking after themselves by getting enough sleep, eating well and drinking enough water or may look at them prepping themselves before they know they may be triggered. By preparing in these ways a young person can tolerate extra distress without feeling out of control and then reduce their chance of using unhelpful strategies such as substance use. Also for young people who have experienced complex trauma, they can often exist at a very high level of arousal day to day (e.g. present as constantly irritable) and therefore, they do not need much to tip them over into a flight/fight response. Integrating strategies to reduce arousal state into day to day life e.g. regular exercise, can be very helpful. A way to understand this is to imagine a young person walking around day-to-day carrying two buckets of water that are both nearly full. It takes lot of energy and effort to keep these from tipping throughout the day, leaving them exhausted, frustrated and vulnerable. For them, it doesn’t take much more water for the bucket to overflow. Alternatively, finding ways to tip even smalls bits of the water out over the day will mean the buckets are easier to manage and more is needed for them to overflow. In other words, helping a young person to find ways to reduce arousal level over the day may reduce their chance of becoming emotionally overwhelmed. This is about young people finding useful quick exercise such as controlled breathing or grounding that work in the moment. Having a range of things that work for them within different situations is important. Practicing these when they are least distressed can make it easier for them to use them when they are. Reflecting on their learning is important. Give them some praise and reward for coping in more helpful ways. Trauma can affect the way young people think about themselves, other people, and the world. These thoughts are often really strong and persistent – things like “The world is a dangerous place”, “People can’t be trusted”, “I’m unlovable” and “I’m to blame for what has happened to me”. These can often make young people feel really ‘stuck’. Supporting a young person to introduce helpful thinking instead is about helping them look at whether their thoughts make things seem worse or harder (unhelpful thoughts), or more manageable and less painful (helpful thoughts). What are the thoughts that bother the young person the most, are most painful or get in the way of them doing things? What could be an alternative? A good way to work out what these might be is to ask a young person about the thoughts they have when they are feeling really distressed. This could be something like “I can’t cope. I’m terrible at dealing with situations like this.” A young person’s response to this is a sense of hopelessness, helplessness and feeling quite incompetent. Helping them reframe this to something like “I got myself here today and that says that I am coping ok” can be useful and change their response. Explore with them different ways of looking at situations or get them to try and see ways they would support another young person having the same thought. 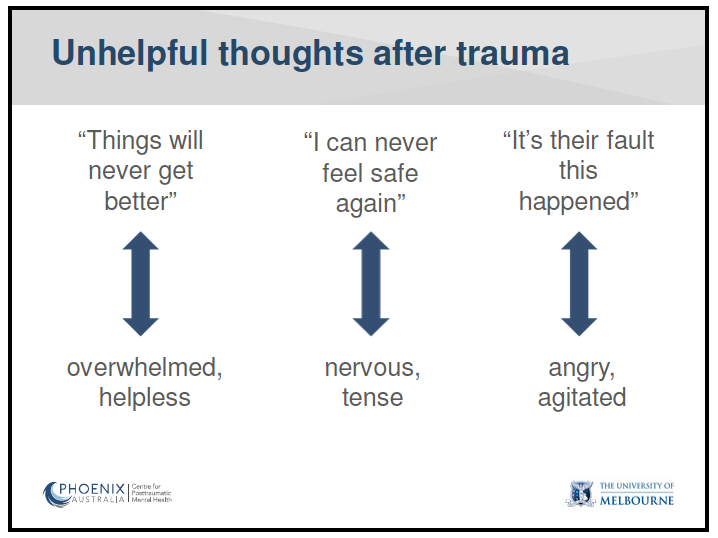 This can be very difficult as often their views and beliefs are strongly ingrained however by shining a light on these thoughts and how they are linked to their experience of trauma can be a first step towards a young person seeing ways that things could be better. Being connected and having positive supports is really important however it is often a really difficult thing for a young person who has experienced trauma to do. A young person’s ability to establish trusting and safe relationships is really difficult when they have experiences of trauma, particularly trauma that involved other people such as sexual or physical abuse. Being patient and making efforts to build rapport and trust is crucial to the success of any intervention with a young person. Encourage them to think broadly, not only about supports from friends or family but also people that can support them with practical things, who can help them get things done or someone who will just spend time with them without feeling like they have to talk. Sometimes young people will find re-connecting with social networks or re-discovering enjoyable activities difficult, and often there will be a period where engaging with these things will still feel like ‘pulling teeth’. However, it is important to encourage young people to persist – fake it until they make it.